BlackBerry today announced at their press cobference in Mumbai their all new BlackBerry 10 phones – the BB Z10 and Q10. 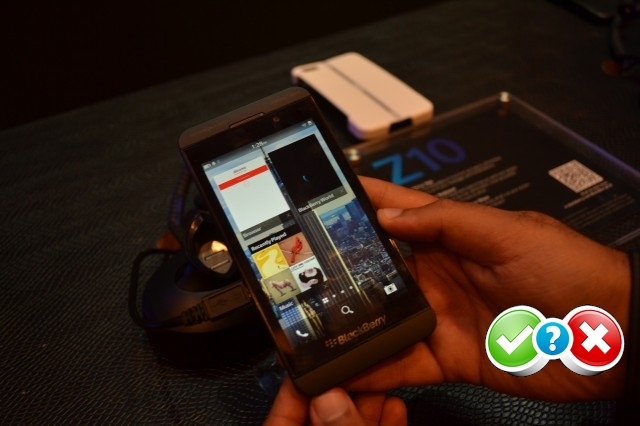 BlackBerry Z10 is an all touch BBOS10 phone filled with all its gesture goodies to make one handed operation simple. Same is the case with its second device – Q10 which is an impressively built BBOS10 phone with its classic qwerty keypad with a great tactile feedback. The BlackBerry Z10 phone is priced at 43,490 INR but expected to retail around for 40k in the Indian market.This places the phone in the price bracket of high-end touchscreen phones like the Iphone 5 and Galaxy Note 2 and the upcoming HTC Butterfly , although at this point you may question and compare the hardware u get for the same. The BlackBerry Z10 has a 4.2-inch screen (diagonal) with a resolution of 1280 by 768 pixels. This comes to 356 pixels per inch(ppi). It is powered by a dual-core CPU clocked to 1.5GHz with 2GB RAM. The Z10 would start shipping starting tomorrow for those who pre-ordered the device. More eyes seemed to tempted to the Q10 which happens to be device running BlackBerry10 with their most popular QWERTY keypad – which we know BlackBerry best for. The device also sports a 720×720 resolution on a 3.1-inch square toucscreen. Under the hood it is powered by a 1.5 GHz dual core processor with 16 GB Flash memory. However, no pricing information is available yet and the release date is expected to be somewhere around May. New Delhi, India, 25 February 2013 – BlackBerry® (NASDAQ: BBRY; TSX: BB) today introduced the new BlackBerry® Z10 smartphone powered by BlackBerry® 10 in India. The BlackBerry Z10 is the first BlackBerry smartphone to launch with the re-designed, re-engineered, and re-invented BlackBerry 10 platform, which offers customers a faster, smarter and smoother experience than any other BlackBerry smartphone they have used before. “Without a doubt the BlackBerry Z10 is among the most important and much awaited BlackBerry launches in the history of the Indian smartphone industry, and we are thrilled to launch the new BlackBerry Z10 smartphone with our carrier and retail partners across India. With BlackBerry 10, we have re-designed, re-engineered and re-invented BlackBerry to create a new and unique mobile computing experience, and we are uniquely positioned to change the way in which our customers view mobile technology. With BlackBerry 10, every feature, every gesture, and every detail is designed to keep you moving,” said Mr. Sunil Dutt, Managing Director for India at BlackBerry. · The ever present BlackBerry® Hub, which is a single place to manage all your conversations whether personal or work email, BBM™ messages, social media updates or notifications, and the ability to “peek” into the BlackBerry Hub from anywhere, so you’re always only one swipe away from what matters to you. · BlackBerry® Flow, where the BlackBerry 10 experience excels by enabling features and apps to flow seamlessly together, helping you complete the task at hand effortlessly and efficiently. For example, you can tap on an attendee listed for a meeting to see their latest tweet or LinkedIn profile. Or tap the thumbnail of a picture you just took to launch the Picture editor and quickly apply a transformation or filter, then instantly share it with your contacts. 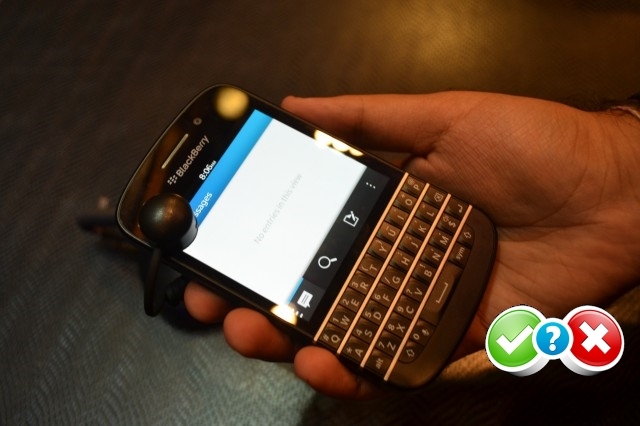 · BlackBerry® Remember, which combines memos, tasks and much more into a single experience. It helps you organize and manage information you have on your smartphone around projects or ideas, letting you collect content such as websites, emails, photos, documents, and other files, and then like a To-Do list, lets you create tasks, assign due dates, and track your progress. If your BlackBerry 10 smartphone is set up with a work account, your Microsoft® Outlook® Tasks will automatically be wirelessly synced with BlackBerry Remember. If you have configured an Evernote account with your smartphone, BlackBerry Remember will sync Evernote workbooks as well. · Built-in support for Microsoft Exchange ActiveSync® so your BlackBerry Z10 smartphone can be simply connected and managed as other ActiveSync devices in a company, or enabled with BlackBerry® Enterprise Service 10 to gain secure access to work email, “behind the firewall” applications and data, and benefit from other security and enterprise mobility management features. · The BlackBerry® World™ storefront, which includes over 70,000 BlackBerry 10 apps and one of the most robust music catalogs in mobile today. In addition, Facebook, Twitter, LinkedIn and Foursquare apps for BlackBerry 10 are preinstalled, and BlackBerry 10 customers will have access to leading applications from across the globe. Leading application providers including Disney, Cisco, Foursquare, Skype and Rovio have committed to the platform, and more than 9,000 apps from Indian developers across a variety of categories will be available including: PVR, HDFC, Tap Cricket, Gold’s Gym, Hungama, Map My India, Zomato, Jet Airways, Myplex, Juno for Tally, Ride smart, Track my car, Measure treasure, Blood Bank for BlackBerry, and My native language. The BlackBerry Z10 will be available in over 2000 retail outlets across 50 cities in India and will support carriers respective 3G or HSPA+ networks, including connectivity support for global roaming. The BlackBerry Z10 smartphones will also come in White and Black. Previous articleNews : Asus Padfone Infinity announced at MWC, costs 70,000INR.